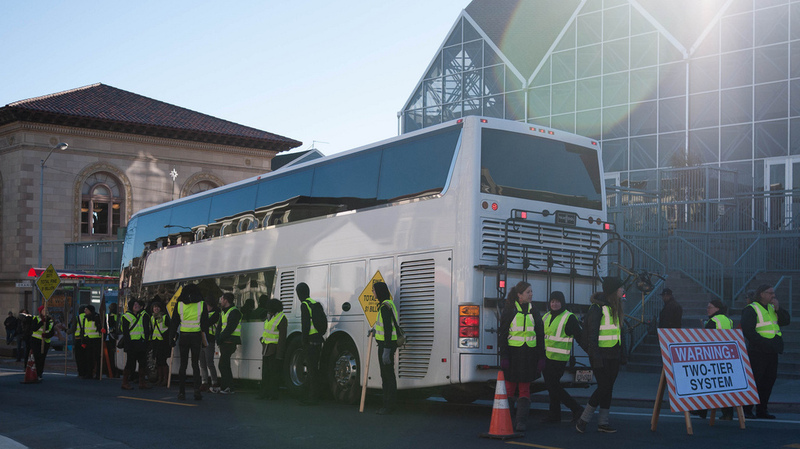 In A Divided San Francisco, Private Tech Buses Drive Tension : All Tech Considered Some of the most heated protests in San Francisco have been over big, sleek buses — private shuttles that Silicon Valley tech companies like Google and Facebook use to get their city-living employees to work. They've become a symbol of the city's changing socioeconomic landscape. Protesters in San Francisco block a Google bus, which shuttles employees from the city to its location in Silicon Valley. If you want to understand the tension between tech workers in San Francisco, who often make six figures, and many of the city's other residents, try standing on the southwest corner of 24th Street and Valencia around 7:30 on a weekday morning. That corner is in the Mission District, a historically working-class and heavily Latino neighborhood. Dozens of tech workers are lined up against the wall of an old neighborhood cafe — mostly young white men wearing headphones. In front of them, there's a public bus shelter. The only person using it is a homeless man sleeping inside. And then there's the street, which is filled — pretty much endlessly — with the loud sounds of engines and shooting bus pistons. This is the sound of the private tech shuttles: sleek, unmarked double-deckers with tinted windows. One pulls up every few minutes. Tech companies like Google, Yahoo and Apple have locations in Silicon Valley, about an hour's drive south of the city. But because a lot of their employees live in San Francisco, many companies use a network of private shuttle buses to get their people to work. For some residents, the buses have started to symbolize San Francisco's economic segregation. The idea of a private company running a private bus isn't new. Microsoft does it in Seattle; Disney does it in Los Angeles. But in San Francisco, a bus is not just a bus — it's a symbol of dramatic and often uncomfortable economic change. The tech boom has made neighborhoods like the Mission District richer, and whiter. In San Francisco, tech worker Brian Leair likes riding the private bus for all the reasons these companies run them. First, it's convenient — it's not easy to take public transit to Cisco, the tech giant where he works. It's better for the environment than driving a car. And it means he can live in the city instead of the suburbs. Still, he understands why the buses frustrate people. "The resentment about — oh, people have high-paying jobs caused by the tech industry, and that's displacing, and rent prices and home prices are going through the roof, and I guess the buses are a visible sign of all that," he says. "You can blame me if you want, but I don't think I'm really the cause of the problem." But some people do blame tech workers like Leair. In a recent protest, demonstrators blocked a Google bus from leaving a stop across the street. They wore neon vests and put out a construction-style sign that said "Warning: Two-Tier System." Their point was clear: one city for the wealthy, another for everyone else. Bina Shrimali lives in the Mission too, and she works for the public health department in nearby Alameda County. Every morning, she walks her son to school just a few blocks from where the shuttles stop. She says she understands where tech workers are coming from. "People feel that if you have worked hard enough, that's why you are successful and you have this great job and you get to live in this great place," Shrimali says. But she and her husband work hard too, she says, and they're still struggling. "If we didn't have rent control, we wouldn't be able to live here anymore," she says. "I think what's missing is the sense that everybody should have opportunities." Sarah-Jane Morris is walking her dog down the same block. She also works in the tech industry and is relatively new to San Francisco. She says she knows she's coming from a privileged position and carries around some guilt because of that. "I moved to this city because of what I felt was still a very vibrant community that embraced all different kinds of people," she says. "So if there's ways and movements that I can get involved with helping with the greater issue and giving back to this awesome city, then I would love to learn more about that." But Morris says even she's not immune to the city's high cost of living. "I'm actually moving out of the neighborhood to a slightly cheaper neighborhood," she says. She couldn't afford to live in the booming Mission District for more than a year.